Here’s some similarities I can point out between Utah’s Mormon and Dinagat’s PBMA. The Church of Jesus Christ of Latter-day Saints (Mormon) was founded by Joseph Smith in New York State in the USA in 1830. 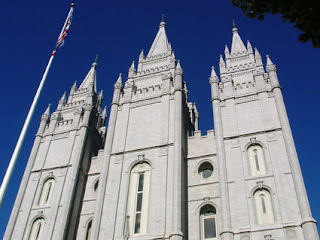 The Mormons saw Salt Lake City Utah as their holy city - Brigham Young called it a Kingdom of Heaven on Earth. Ruben Edera Ecleo, a Filipino spiritual leader founded the Philippine Benevolent Missionaries Association, Incorporated in 1965 in San Jose Dinagat and called it the Holy Land. Mormons find their migration to Utah as equivalent to the migration of Israelites forced to leave Egypt in search of Promised Land. Dinagat Island is a Holy Land by PBMA members and brings them here. What I’ve heard from one account. Migration gathered in Dinagat in great numbers because of the propaganda of falling SkyLab. Dinagat believed to be the only safe place when this Satellite comes down. Mormon practices doctrine of plural marriage was seen as a serious attack on the social and ethical rules. As with late Ruben Ecleo Sr, he was known to have “material wife” and “spiritual wives” and practices polygamy. The Mormons asked the US government to make a new state. They call it Utah (after the local Ute tribe of Native Americans) and the Church leader Brigham Young became the Governor. The rapidly growing Mormon communities had the potential to exercise considerable political power in Utah. Same as PBMA in Dinagat, political power in the Island province is unmistakably indisputable. Daughter of late Ruben Ecleo Sr. is now the Governor. What can you say? And since Utah hosted big time the last winter Olympic, do you think one of these days Dinagat will also host one of worlds well known events? Changes: We change the term used from Religion to Organization. Its not True that the skylab fueled the migration. I was high school then in SNC when skylab came back to earth and san jose that time was crowded already w/ immigrants. The real story of their exodus to me are, these people were being cured of thewr sickness by PBMA missionaries and by the Master himself, and promised or having a PANATA na paggumaling duon na sila manirahan sa SJ. Now being cured they were also told by the devine master na may darating na biyaya sa SJ, likes, jobs, money, and its peaceful, etc. Other reasons also was, when souther Mindanao that time was in trouble because of the Muslim-AFP fightings and the Muslims versus the Ilaga. We members of the Church of Jesus Christ of the Latter-day Saints strongly disagree by equating us to the PBMA for lot of reasons. Yes there are people who practiced polygamy in Utah but they are no longer members of the church but continue to claim they are. Some are never been members. They are separate groups. Just like the Catholic church. Some members considers themselves catholics but are already drifting away from the doctrine of the church. They believe that they are catholics because they grow up in a catholic family although they never go to church. Our church believe in Jesus Christ as our personal saviour. The PBMA called their leader MASTER. They worship their leader and we worship Jesus Christ. I may categorally consider them a CULT and ours is a religion. "I wish to state categorically that this Church has nothing whatsoever to do with those practicing polygamy. They are not members of this Church. Most of them have never been members. They are in violation of the civil law . . . If any of our members are found to be practicing plural marriage, they are excommunicated, the most serious penalty the Church can impose. Not only are those so involved in direct violation of the civil law, they are in violation of the law of this Church." Truly I'm NOT offended with your article but rather found it as an opportunity to share to all readers and to correct misconceptions equating a church to a cult. No they are not the same. They have the Book of Mormons the other don't have. In contrary they have the Rings(that represent their membership) the other don't have. The other have churches the other don't have. The other believe in Jesus Christ, the other worship their Supreme Master who is dead. The other is into healing people and believed it's the work of their master, the other prays for the sick people and when healed, believe it's the work of Jesus Christ. They have missionaries. The other will invite people to live in Dinagat the other don't. They will invite people to go to church. And yes the other don't have armed bodyguards. San Jose is very appealing to me. 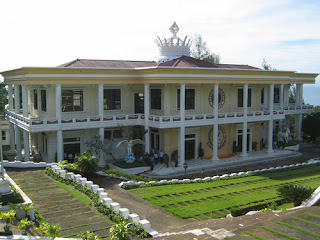 And I am pleased you have posted a photo of PBMA shrine. I can't often visit that place. And it really appease my heart just by looking at the photo. I wish you increase your research more on the PBMA phenomenon, particularly more on the healing/curing aspect. What reasons behind why members still clinging despite all the trials and negative issues encountered. Instead of tagging as cult, it is much better to search the rationale behind of the practices which are evident with the discipline and dedication on the members. With such remote Island before, now the island captures the eyes of the world where such island is endowed with so much natural beauty, mineral resources and vast mysteries and now a province. Truly, such island is loved and blessed by God. There are so many interesting subject matters that you can publish or discuss in your website. But never discuss anything about religion especially comparing one from another. It will fuel lots of opinions, controversies or what not and what will your readers gain from it? NOTHING!!! What’s next here… DaVince Code? I think this is not about religion. This is about the foundation of Dinagat compared to Utah. Controversy in any religion is normal. Yes it is true Catholics are asking for apology for the past sins. Not to mention killing of innocent people by Catholics in the history. And not just Christians, it is also true to any religion, Islam, Buddhism, Hindu etc. I don't get it. Is polygamy a bad thing? It depends on what is your reference. As long as all parties agrees there is no problem. Pwede kabit-kabit lang diay. How about Erap? or Dolphy? -The PBMA primer states it is “neither religion nor a sect.” It describes PBMA as an association for brotherhood and charity. “Members have been constantly urged to strengthen their faith and relations with the religion where they respectively belong,” the primer adds. - Religion is the adherence to codified beliefs and rituals that generally involve a faith in a spiritual nature and a study of inherited ancestral traditions, knowledge and wisdom related to understanding human life. The term "religion" refers to both the personal practices related to faith as well as to the larger shared systems of belief. They need to understand the religious sources that inspired Gandhi, Albert Schweitzer, and Mother Teresa to commit their life to the alleviation of human suffering. But they also need to learn the shadow side of religion: how religious beliefs have contributed to hatred, intolerance, oppression, discrimination, as well as mass murders and genocides in such places as Nazi Germany, Bosnia, East Timor, Kosovo, Northern Ireland, the Middle East, Sudan and countless other countries. At long last, this site is becoming more professional in terms particpants' way of sharing opinions and views on issues that catch peoples' interests. However, in some degree the deviation to the original view is unaviodable and that leads to another topic of different interests. The original topic is all about the emergence of the State of Utah and the birth of Dinagat Province cited as similar in some respects. Period. I personally agree that Dinagat Province in the near future will be like the State of Utah, which will also become famous and be part of Philippine's Pride. So, I would rather devoid myself from citing any religious issue that will only fuel differences between and among the participants/contributors. For me, religious differences has no place in discussions like this. Let us be more human and more rational. Members of PBMA will not have a growing population if they are practicing bad practices....Think of it, how it gathers million of members throughout the world if they are having bad practices? And the thing here is why people compare PBMA to religions in fact it is not a religion...it is an organization where all religious sects are welcome to be a part of organization. Hope soon will understand what they are saying... GOOD LUCK!!! yours people. and one thing just to be clear about the issue that we are a cult. how can we be a cult because we are registered in Security and exchange commission, and most of all we are not worshiping those rocks, skulls of dead animals, wind, and 'ECT.. so now tell me how come 'you call us a CULT??? prove it first before you judge or give a comment that that will make you regret at the end of time. Don't judge the other so that God won't judge you as well. and always remember brothers and sister, there is no religious group who can save you from fire or hell either. it is only you and your deeds will save you from the punishment of god. thank you and more power!!!! What Skylab? I was born and raised in Dinagat and have known Reuben Ecleo Sr. personally as he was the town's Mayor, mano Paler was the town's Vice mayor and my father was the town's Kapitan. A cult from my point of view is a system of religious worship or ritual who by the way has admiration for a person or that person's principles and because of such unbelievable qualities attracted hundreds or thousands of followers, not to mentioned, Reuben Ecleo Sr. in those days were among those well blessed individuals financially. Reuben Ecleo Sr. doesn't performed miracles or cured sickness. He is just a very down to earth, kind hearted, charming, generous...OMG! very generous especially to women of his likings. He has 1 legal wife and the rest are "kabits, resulting in undisclosed numbers of illigitimate children. Well, if you got the money, people will cheerish the grounds you walked on and through my observation...that's exactly what happened and not because he cured sickness. People who believe in Jesus Christ our savior knew exactly what I'm talking about. Also, Dinagat will be popular because of the people with whom majority of original Dinagatnons managed to be among those rich, well educated people all over the world. Dinagat Island is fast growing because of the existence of PBMA and Master, as the first developer of the island. In the near future, the province will be more progressive thru the different mines of the island and tourist attractions. I hope the National Government can help improve the province and in return the province can also contribute to the country's economy. Let us all unite regardless of the religion we have.By the Aricles of Incorporation of PBMA,Inc. duly registered in SEC,it is an association of brotherhood. Thanks, you may email me at juno.peralta@yahoo.com. Yes, it is true that PBMA and mormons has similarity. Before my research paper or thesis is about sect or cult, I studied all kind of sect and cult. MOrmons is one of them and PBMA.why? because they practice polygammy and they worship their leader instead God. I Am updated about this kind of sect. They even kill others just to depend thier leader. They brain wash by their leader and hypnotize it. They are very devoted to their leader and they worship too to thier master or leader. Instead of God in heaven who creadted the heavens and the earth they worhip them. they saled their inheritance and leave the same place. I understand it is very danger. Ive read so many news about davide koresh, solar templar, and the guyana events which innocent children are their, they suicide together because they believe that christ resurrect them. Because he is the one who can save us. their is no other solution for that. thank you for reading about my commets or some information about this.. It is no longer an issue if PBMA is a cult or a sect, or with similarities with Mormonism (not Mormon). "The foundation has been established" so don't worry about the critics anymore, after all the long dream has been realized and now Dinagat Islands is already a province. From this very moment onward, please, I want you to list down all the negative things you have searched or read about PBMA and see how in reality is it doing for the good and development of Dinagat Province and its people. Better yet, ask the "dedicated members" what they have done to their brethen or what they have learned from PBMA and compare these to what you have learned. "Many are called, but only few are chosen." "Many have seen but only few believed it." "Many are worshipping His holy name but rejecting His material body." "Many have witnessed His miracles but no one was brave enough to defend Him from crucifixion." He might already had talked to you through His desciples but you refused to listen to them. Only time can tell. Let us wait 'till the last judgement. My father was a die hard member of PBMA because he was spiritually cured of his sickness which the medical doctor had already said that his decease is incurable. It was then that a missionary of Ecleo had cured him. Since my parents dont know about bible so as an honest man and afraid about God he believes that God had call him. So that was December 1970 when we migrate to Dinagat Islands in which that island is like paradise to me in which the sorrounding islands and its seas are bountiful of fish. I was an academic scholar of our organization it was just lately that I discover that we worship God in a wrong way. He is not Jesus Christ, so if I am given a chance I can help revised they the prayer we had before. Yes it is a brotherhood organization with strong love with each other. But the problem is the Higher echelon are not believing God, they believed in themself as God. I pray that all religious group either Roman Catholics, Protestant, Church of christ, born again or any denomination should not make PBMA as Cult, they need light so show them light. and try to preach the good news and be a lamb in the middle of the craving lions. I am urging everyone to assimilate and reconstruct our knowlegde about what we have learned and believed in, and be prepared to defend our utmost convictions. Please dont compare to any religion to PBMA because its a hugh diffence. You must be thankful because Dinagat become a New Provine. You better change your topic rather than your hurt millions of people. I am a PBMA member for more than 20 years to date. At first I was active in all its endeavors. Then came the tragedies, the trials, and the issues. I was of little bit dismay because of some National Officers/Officials who took advantages of their positions for personal interests and because of the on-going issues that stained the public image and the good reputation of the Association. However, I still believed in the prophesy foretold that it is here in Dinagat Islands where the "new place for the chosen few" will be re-established. How could you people jump into conclusions without knowing the facts,how can you tell if the water in the ocean is deep just by looking at it? I believe that everyone is entitled to their own opinions,but please people,don't make judgements in someone beliefs based in what you heard and what you read.Are you a mormon? or more so a PBMA? I am a member of one of these groups, and I do respect the beleifs of the other because either way,nobody can save me but my faith and my deeds.I do beleive that no matter what religion or organization you are in,if you are not following God's command,you will be always a sinner. You can read and memorize the bible cover to cover and go to church everyday but do things you are not suppose to.So why waste your time.Just be good people,please promote peace and unity,no more fighting about other people's faith,the more we do it,the happier satans is.Aren't we all the children of God right? Please don't judge!!! !know the facts first by becoming a member of both(maybe)it is up to you! Good Luck and wish everyone to have PEACE!!! i have kababayan in negros, she was operated tumor cancer 2 years ago, sad to say after 1 year nagbalik ang kanyang tumor at naging malala pa kay sa dati. In this world, their are two kinds of people wicked and righteous, light and darkness, God and satan. I dont know what kind of spirit ruben eclio has. the bible says we can know them by their fruits, results, their teaching if he really belongs to God. the members should careful in daling with his doctrine. consult the bible and the bible alone. three reasons why a person dies: sickness, accident or old age. your "kababayan" died because of her sickness. you did not mention if she was operated (surgically) by a doctor or by a pbma missionary but you confirmed she was "healed" after the operation. you must have to understand this - that a cancer/tumor may come back after the operation. she was healed and that's a fact. her sickness came back for two reasons: either 1) lack of discipline, or 2) it's her fate to die through that sickness. now, do not put the blame to whoever healed/operated her for she was helped successfully. I just droppin by this site and find more interesting when people exchanging thier beliefs and ideas about PBMA Inc.
By the way, Im truly a blooded dinagatnon for I Was born at San Jose, Dinagat (Baltazar,Dinagat), and should say Ecleo family is part of Town's achievements since then. FYI, articles written here was just the comparison of the State Of Utah from Dinagat and nothing more. The author was just stressing out what would be the future progress of Dinagat Islands as time come. And yet, not declaring that PBMA is the SAME with yours-Mormons. Think rationally men and not for little length. Just do some research first before you could stressed out your defense mechanism coz you may get caught by your own net. Mormon people pls dont get mad,dont argue with regards to this writtings, Preach and spread the word of God instead. P.S, whatever myths and origin of PBMA was, not of your business otherwise doing thesis unto it. Ecleo clan are good mentors of PBMA and not just for the org itselt but dedicate also for the development of Dinagat just for the welfare of Dinagatnons. Mabuhay ang Dinagatnons. We're so blessed for we are now separated from our mother province SDN, and now we can surely focused on the development of our own TOWN and beloved Province of Dinagat as a whole. A pleasant hour to all, just a little information and sort of suggestions. Don't you remember the Golden Rule? "Don't do unto others what you don't want others do unto you!" and the message of Jesus Christ,"Don't judge others so you won't be judged ..." I, a PBMA member, just want to help and let people live harmonious and peaceful in this universe, would like to say, PBMA members,for the information of everybody fully believed in God!! !The Holy Trinity!!! and what is the matter if call our Prime Minister a "Master!" don't you realized that there is Master of all Masters! and you too why calling your father a Father that in fact we all have one Father in Heaven!,that's what Jesus Christ,our Saviour said! and a little knowledge, Jesus Christ said, "Let those who do evil, still continue to do evil and those who do good continue to do good! ", for it is not how long we serve God but it's on our perseverance and in always service to Him,the Almighty One!,what's there if you are faithful up to 99 but by final,100, you do bad things...you failed...take a lesson from the parable of Jesus about the "Hired workers" they are not paid by how long of time they work but by the perseverance up to the last hour 'til they received their wages! so just do good! don't try to judge us, Our Founder leaves an inspirational message..."Matam-is kanunay ang magpaka ubos! "...Don't try to let the times of prophets be back again by judging falsely through the Words of God in the Holy Scripture!, those who let Jesus suffered and crucufied Him do that! "If you do good,continue to be good,otherwise He will come to judge you and punish you! "Be Happy and Be Holy! mabuhay tayong mga PBMA!!! I have an uncle who was a missionary of PBMA, and he is now suffering from psychiatric problems. I believe psychological torture and brainwashing are used in PBMA especially when a member goes into a higher level of his PBMA faith. The sad thing is that many people are recruited into PBMA without knowing that they are gradually being brainwashed until they become unable to distinguish between truth and deception. I wish not concur on it. I assume polite post. Particularly the designation attracted me to read the intact story. Why is it there are many religions in the world who believe in Jesus yet they have differrent doctrines? but they have one thing in common, they believe that Jesus is still coming..what if Jesus is already living among us will you believe Him? Beloved people Think million times before you say a word that someday you might eat it with guilt, whoever ashamed His Son will never enter to His Father Kingdom think about it before the end is come, the end is near as well as the tribulation is coming. He is Today, tommorow and yesterday. put it to your mind and your heart. This message extended to you who refuse Him: *Im a Man That Cares for the Needy and Helpless, Sometimes I Feel to Blessed and Sometimes I Feel Like I Dont Want to Be Alive, Im Here to Live and for the Shortest Time, I Hope That Some People See the Reason of My Life, For the Time Spent With So Many People That Cherishes Everything Their Life Is Worth, Some People Live to Be Cruel to Others and Some People Live to Decieve Their Own Raise, Some Live to Let Other People Know What Life Is and Some Live to Be Heroes and So on and So Forth, I Guess Thats Just Life for You, Whats Going to Happen to Me Tommorow or the Other Day, Or Sometime May Im Not Worth Living For, But I Guess, Yes Your Right. Think about it million times so that you will realize it. I'm a humble member of beloved PBMA grandchild of the 1'st 13th former the first 24th. Before I graduated from college of Mystery, my mother was one recieved a miracle from Cancer of bones and the one benifited the Mercy of Divine love and healing and she's happy now from uncurable illness. to all the people who knew material way of living please don't judge for you don't know who's most get hurting from your word. If i'm allowed to shout it I will do it again and again, but I stay like this just a humble servant and stay the same out of His wonders and glorious. Continue Love each other my Brod. and Sis, to whom knew and accept the Son of God has the authority to call His Father..Thanks to Almighty Father! Phrase: Jesus is coming=to let himself know to the world. I strongly disagree the comparison between the PBMA and Mormonism. _I was born in the environment of PBMA-San Jose, lived San Jose and Dinagat and later converted to Mormons. I choose it to be my religion for many reasons. I respect my PBMA member relatives as well as their belief because mormons respects one to another. Whatever PBMA beliefs is I wont say any comments for those. A comment posted from a concerned member is enough to let the public know what the Church of Jesus Christ of latter-Day Saints is. Religious sect topic is very interesting and sometimes fuels misconceptions and misunderstanding and defending by the believers. Being a member of the Church of Jesus Christ of Latter-Day Saints is a blessing into my life. With the pressures of our earthly life, my membership of this church enlighten my mind and made me understand the meaning of my existence, before I was born and after this life. The church helps me understand and answer the questions in my life I longed search. "Sandigan orders arrest of cult leader-solon for graft"
I am a concerned citizen of this REpublic! And a relative of the Ecleo(s) his mother side! You are all accountable of what comes out from your mouth and thoughts! Why dont you pray for Dinagat Islands and its people than wagging with speculations! Let us pray in whatever version we can to save our souls rather than arguing with this cult or religion. New Jerusalem or whatsoever, at the end of the day, all of us will go six feet below the ground. We will just prepare for our life after death, and follow the 10Commandments of God, Pillars of Islam, Teachings of Buddha, etc. No religion can save us except our deeds. God Bless to all of us, may this enlightened us all. I can't blame those people who labeled our association negatively simply because they didn't know it by heart. I cannot tell you to keep your bitter criticism to yourself because this is a democratic country and everyone has its freedom to express their ideas and opinions.I just would like to share my thoughts about this matter. Soon enough I would hopefully be one of the many professionals belonging to this association and I can consider myself as one of the living evidence of the many great things our association has done,great things which most people has failed to see,things that they failed to see because they are blinded by prejudice and bitterness towards us and sadly,most of them were professionals. with all due respect to your expertise,may I leave you this reminder. If you didn't know a thing fully by heart,refrain from giving bitter comments about it because your just simply ruining your reputation as a person and as a professional. and for your information,we have missionaries scattered all over the Philippines.